I'm creating an addon and can't get it to work, so I want to ask which object types have a restrictive size limit. On my searches I found that com, res, ind and station can only be 1 tile, but there's any other that has it's restriction? In preference I want to know if signs have it. Yes, signs can only stand on one tile. But there's anything I can add over road way with more than 1 tile? one possible workaround, if you need more than one tile of painting room, is to use a larger pak size. The only catch to this is that it can be tedious to get the alignment correct. Well I'm current creating a suspension bridge. I found one here at the forums but I didn't liked the model, so I want to create mine. This version comes with lot of tiles and I don't want to create billions of pieces like that, so I thought about creating a sign so you place it on the bridge and can rotate it. It should be easier, like the start of the bridge can be the same piece for the end but rotated. If I create a pak256 res building it becomes a 2x2 res building in a pak128? yes, pak256 gives you twice the resolution, but also twice the size. easiest way to see what happens is to put some pak128 files into pak64. For the amount it is possible to use larger graphics. For the area it is not possible. Since there are still limits or errors are displayed graphic. Tilecutter maximum is pak240, makeobject can't create a pak256? It become too difficult creating what I want. I think it's better using DirrrtyDirk suggestion way-object, I was looking pak96.comic and it comes with some stations with this feature. But it allows a height of 2? Next makeobj (or if you compile it yourself) supports paksize up to 65535 ... so there is probably not the limitation anymore. How much bigger than a FullHD is this? That's really huge, I think i don't need it. Anyway, I'll use DirrrtyDirk suggestion, I thought here for a while and made some draws and it will be better using a way-object. No, it doesn't work this way. So I doubt that you will manage a height of 2 with way-objects... at least I cannot think of a way to do it spontaneously. The japanese community produced a suspension bridge (maybe that's the one you saw) but that is quite tricky to build in game and it uses various tricks (including building stations/stops IIRC) to make things work. I don't think there is much else you can do for a large suspension bridge with pillars of bigger height than 1... Simutrans doesn't really support things like that (yet). I just wanted a 2 height to look better, but I think I can modify it to fit 1 tile, or I combine your idea with AEO's idea. I think with a pak240 object I can create what I want. I'll post it on pak128 addons when I finally get it at least working. Yes, but with separate pictures for all the ends - and that is the part that's probably interesting for you. Now, B is just the repetition of the same image over and over, but A and C (=the ends) can be unique. Same is true for the other direction, you have a repeating image E and two unique images D and F.
But yes, it is tricky and only a work-around - you have to see for yourself if you can use it for your purposes or not. And if you want to do so, too. I think I can't create it, i will show you the first design I made. 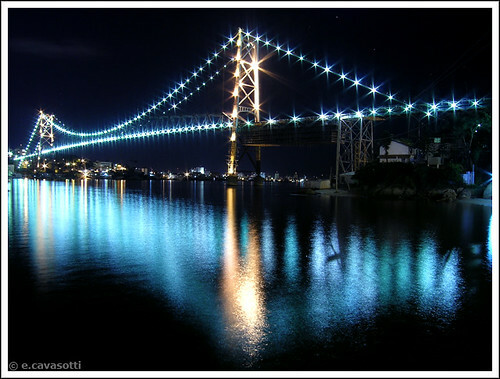 It's a very famous bridge here in Brazil, Hercílio Luz is a historical bridge built to connect Florianópolis to the continent. What I can do to make this placeable on Simutrans? Any help? Ok, it is (or at least it should be) technically possible to do this in Simutrans. It might require a lot of work, and it would probably be very tricky - both, to create and to build in game. It also depends on how strictly you want to stick to the original. Some deviations there might make a few things a little easier and more versatile as well... Let's face it: if you want to use something like your graphic (which is nice by the way) 1:1, you'd have to do what the japanese community did: use stations on the basic bridge, one for each tile. And basically this would require the bridge to be built in game with one specific length only (as any single tile shorter or longer would distort the look). As I said: a lot of work. And it might still come to the point where you find out it really doesn't work after all (or at least not well enough for you to be happy with the result). I have downloaded rev. 3806 and compiled makeobj. It worked fine with pak64, 128, and 192, but not for 384. Is there a newer version? Or did I do something wrong. I want to make such a bridge. This should be easier than a suspension bridge to create in Simutrans. could you upload png / dat? Can anyone send me the latest makeobject that works for pak256? I don't mind if it's a nightly. Error message I have got when I tried to make pak384 object. I compiled makobj, and got the following result. Lots of warnings, but a pak file of 74kB was written. Maybe you missed the 'pak384' argument? These warning messages are exactly the same as I have received when I paked the pak128 version. I don't think I missed "pak384" argument. But, OK, I think I have done something wrong. I will recompile makeobj and retry. Thanks for your help. By the way, I'm on Windows XP and using MinGW to compile. Actually, prissi silently fixed a bug Please update the source code to revision 3822. This should fix it. I used makeobj rev 3822 above. I tried with rev. 3826 and the pak384 bridge was paked. But apparently the makeobj ignores the image offset.